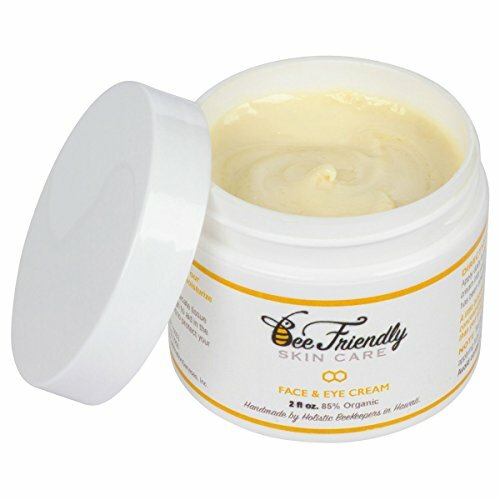 What is the Face and Eye Cream Moisturizer from Beefriendly? Why does a formula like this work anyway? What are the positives? What about the negatives? Most of us know that taking good care of the skin is essential on the long run so you need to start early. If you’re not willing to make the compromise and you’re determined to only use the natural and organic cosmetic products, it gets a bit more challenging for finding the right choice every time. Even though many natural and organic skin care products may not give the impressive results of the ones based on chemicals, chances are you’re still going to find something to fit your skin and budget, at the same time. The BeeFriendly Face and Eye Cream Moisturizer fights aging of skin and is made with natural and certified organic ingredients that reduce the fine lines and wrinkles. The moisturizer goes deeply into the skin, locking in the moisture and leaving your skin younger and glowing. You may use it both as daily or night cream, even though some think it’s a bit thick for a daily moisturizer. Therefore, some only included it in their night time skin care routine. The moisturizer is all in one- eye, face, neck and décolleté cream that works for men and women. You can confidently use it for eyelids, behind ears and on your hands too. It addresses all skin types, acne-prone, sensitive and dry as well. It may even improve the appearance of crow’s feet, circles, liver spots, and dark spots. The moisturizer is handmade by Holistic BeeKeepers in Hawaii and the list on ingredients includes organic extra virgin olive oil, purified water, raw Hawaiian honey w/royal Jelly, vitamin E, essential oils and Beeswax w/pollen and propolis. The formula doesn’t include fillers, chemicals, SLS, parabens nor fragrances. It’s gluten free and non GMO and has never been tested on animals. Beeswax- increases the elasticity and softness of your skin, leaving it suppler too. It doesn’t clog pores and it’s non-comedogenic. Propolis- has anti-bacterial potency and heals the skin, while protecting it from further damage. Bee pollen- is loaded with nutrients for the skin. Organic olive oil-it’s an important skin cell regenerator. It fights aging of skin and moisturizes it efficiently. It eliminates the dead skin cells from the skin and improves its firmness and smoothness. It hydrates the skin and gives it the nutrients it needs. Bergamot essential oil- cleanses the skin and removes dirt and impurities from skin. It’s a great ingredient for the oily skin, as it unclogs the pores. It balances the oily skin. Amyris sandal wood essential oil- is antiseptic and calms the skin. It slows down aging of skin and regenerates the skin. Raw honey- is a great antibiotic that hydrates the skin. It boosts the collagen production and the skin cell regeneration. The formula is based on all natural ingredients that feed your skin and hydrate your skin on deeper level. You should apply the moisturizer after the cleansing of your skin. You need to rub the cream nice and easy, using small circular movements until it’s fully absorbed. A little goes a long way so the moisturizer is going to last for a good amount of time. Keep this in mind as you don’t want to over apply it. It’s only going to need longer time until full absorbency. In order to get better results, don’t forget to stir it nice and easy before each use. The moisturizer leaves a luxurious and nice feel on the skin. It has a smooth and silky texture, working best as night cream. The moisturizer is a great option to use on skin not only because it diminishes the fine lines and wrinkles, fighting the aging process of skin, but also because it’s made with natural and organic ingredients. Recent reviews on Sugar & Fluff Beauty: the Brickell Men’s Advanced Anti-Aging Routine, the Strivectin-TL Tightening Face Serum, the Elemis Dynamic Resurfacing Skin Care System, the Joanna Vargas Exfoliating Mask Review.